But, see that’s the thing: that may be true in essence, but it’s so much more than that. Without the well-defined characters, there would just be Good vs. Evil, and that would be boring. No, Star Wars is so much better than that. Its starts us off with the two droids, R2-D2 and C-3PO, the film’s comic relief and our own initial gateway into this exotic, galaxy-spanning universe and who would together go on to be the unchanging through line between the original and prequel trilogies (and probably now even the sequels). They’re in the midst of a battle (the film wastes very little time in its original form), and we immediately know who’s good and who’s bad because there’s this guy, Darth Vader, who’s this samurai-looking, titanic-voiced villain, and it’s made very clear to us that he doesn’t hesitate to make violent examples of those who fail him. Leia is also introduced, initially as what we would expect to be the typical damsel but who turns out to be an incredibly smart, witty, and resourceful rebel leader who isn’t nearly as in distress as one would have initially predicted. Then we’re introduced to Luke Skywalker, the aw-shucks farm boy who knows he’s destined for greater things but is too tied down by obligations that are of very little interest to him beyond keeping his caretaker uncle and aunt happy with him. When adventure does come calling, we meet Obi-Wan Kenobi, who will become his wise mentor, a Merlin-like figure who guides Luke on to the path to do great things not only for himself, but for the entire galaxy. And, of course, there’s Han Solo, a smartass mercenary who rarely stops to think and who is the exemplary antihero. Let’s also not forget Chewbacca, Han’s faithful and endearingly incomprehensible-to-us companion. 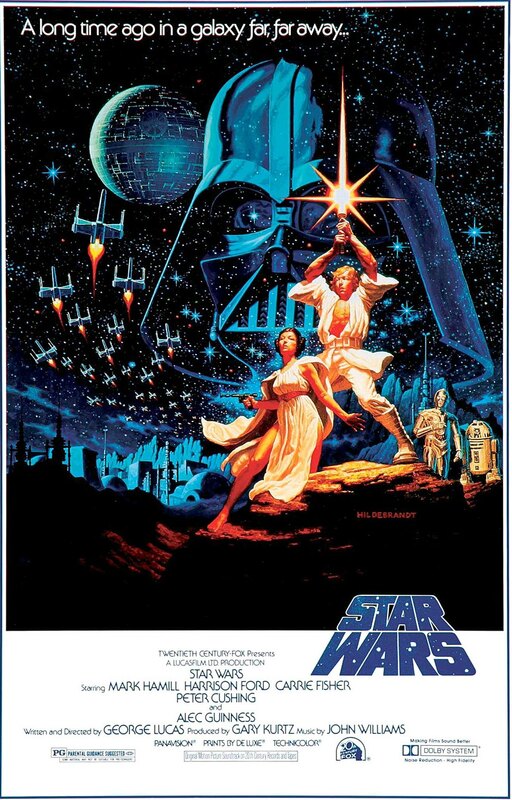 Combine these familiar but entertaining and fascinating characters with imaginative settings, fast-paced action, John Williams’ incredible and iconic score, and one incredible spectacle after another (first the Star Destroyer and then the freaking Death Star! ), and you’ve got yourself one of the greatest movies of all time. There’s really not a whole lot else I can say about the first Star Wars film that hasn’t been said before – and so I do also apologize if much of this seems a bit haphazardly mixed between gushing enthusiasm preceded by personal context. It just shows you, however, why this series, when you actually get to see it, just clicks so well with audiences and resonates with them to the point where from this film onward, we helped to create this massive franchising empire that not many seem to be getting tired of, though. When it comes down to it, sure, its sequel, The Empire Strikes Back, may be the best entry in the eventual series, but let’s not also forget that Star Wars, even before it gained its series-appropriate subtitle, was and is itself one of the best standalone adventure movies of all time.